The Senate voted to reopen the government on Monday, the third day of the shutdown. Under the bill, the government will be open until February 8. “McConnell and I have ‘come to an arrangement,’” Sen. Chuck Shumer says. 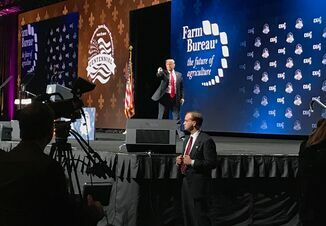 That ‘agreement’ was a commitment from GOP leaders to immediately consider immigration legislation on the floor if no immigration agreement is reached by February 8, according to ProFarmer’s Washington policy analyst, Jim Wiesemeyer. “Senate Majority Leader Mitch McConnell (R-Ky.) promised to take up an immigration bill that would protect an estimated 800,000 Dreamers from deportation, under an open amendment process, if Democrats would agree to end the government shutdown,” he says. The House also has to vote to end the shutdown, but it is widely expected they will by the end of the day. The Dow hit an all-time high on news the Senate reached a deal to reopen the government.